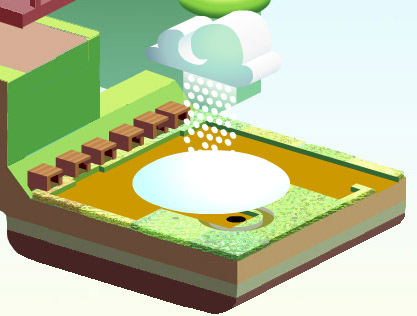 Wonderputt is Damp Gnat’s award winning iOS and online Flash adventure-golf game, launched 15th August 2011 on Kongregate and 13th September 2012 on iPad. Initially estimated at a 2 month production period, ended up taking over 5 months over a year between contract work. It was made using 3DStudioMax (for small objects) but mainly Adobe Photoshop, Flash and cheap note pads. 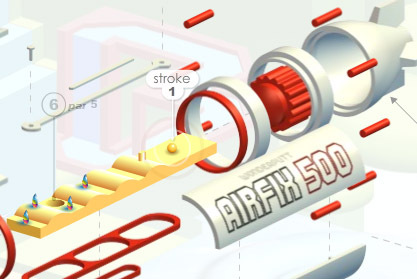 The game uses Adverputt’s core code but with 18 holes, each with their own unique animated features. 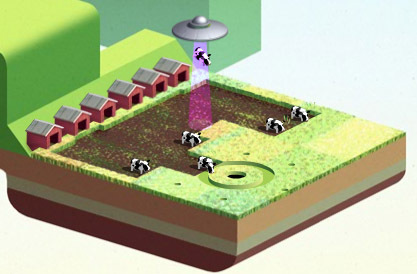 The theme encompasses all manner of scientific illustration from geographic encyclopedias to instruction manuals….. but with cows, toads, ski slopes, torpedos and a sprinkle of alien abduction for good measure. What!? 2012? So what happened in that blink of the eye at Damp Gnat? Apart from selling a shed load of licenses and getting Icycle2 started, GDC in San Francisco was the big event that put Damp Gnat on the map. A talk at FGS, 3 day booth at the IGF and the awards ceremony was a whirlwind of opportunity and one of my busiest week’s to date. Meeting, greeting and eating with a lot of great people and making new friends in the industry was a reeeal joy! What followed was a torrent of correspondence making my inbox full time management. 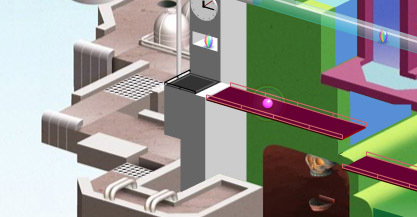 This inevitably delayed development on all projects, but thankfully Tom Krcha from Adobe convinced me Wonderputt could be brought to iPad with relative ease. The development process for the port is discussed on Tom’s blog here. While waiting for Apple approval Dan and I put together a trailer especially for the iOS version. Rather than do a straight forward demonstration it felt important to add the element of spoof with the absurd notion of becoming educated by the game. Thankfully it was included in a lot of the press previews, reviews and interviews which all helped to promote the game during and on the lead up to launch. So how did it do? Marvellous!! Way beyond my expectations. By day two it hit #1 in the UK and remained there for a week! Also hitting #1 and #2 in many other countries mainly in Europe. Worldwide sales reached about 35 thousand downloads in its first week with a second burst the following month when Apple featured it in the Appstore. Its hard to say where most users came from during its launch as there are unfortunately no traffic analytics in iTunes connect. But its likely it was a result of favourable reviews from many websites which I’ve documented in our press page. Its very likely I’ll investigate practicalities of an iPhone port after Icycle2 is done. I’ll look into an Android port at a later date. 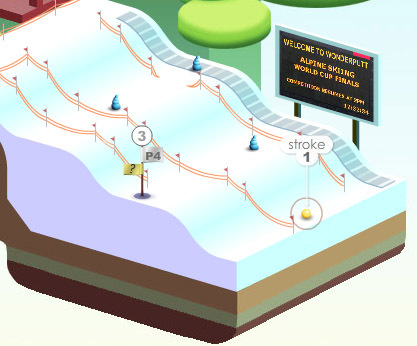 So its head down with Icycle2 for now, thankfully Wonderputt has continued to fund its development. But it has admittedly been much more difficult than previous years to focus and maintain momentum with so much administration and other distractions. Time to delegate! 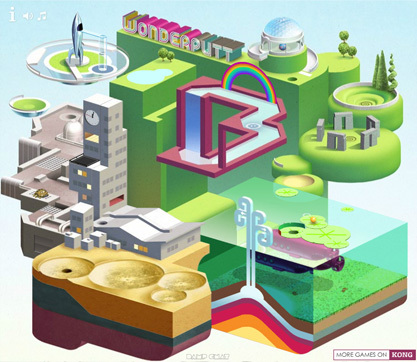 Within Wonderputt’s first two weeks the game has had approximately 2 million plays worldwide and hosted by over 600 sites. So at last, its done! But its never actually done done is it. Game launch proves to be the busiest time. So what’s taken so long?? Sponsorship auction actually took about 6 weeks, involving a surprising amount of promotion and correspondence. I was absolutely elated to find a sponsorship that covered the costs of development. This bodes well for future games development. Although its important to remember how much of a gamble these long term productions are so I want to make sure schedules don’t keep drifting out of hand. Analytics integration, sponsor API integration, auction play-tester feedback alterations, minor game improvements and bug fixes. All of this had to be checked and triple checked before finally committing to upload onto Kong. Within the last few days I found some rediculous bugs related to the latest version of flash player and so had to make some drastic changes to my Flash timeline setup. Kongregate’s user feedback facility was vital in ironing out those last few trapped ball bugs. Thankyou!!!! I’ve been overwhelmed by such an enthusiastic response from the public, press and fellow developers, I’ve struggled to keep on top of it all. If only this could be spread out over the year rather than spike at such initial intensity. I’m doing my best folks! Over the next month I’ll be working on non-exclusive licensed versions for individual portals while trying to complete contract work on another interactive art app. This was the first conceptial drawing of Wonderputt just over a year ago. It was initially intended to act as a site tour to be customised by company websites as required. As the game began to take shape, it soon became clear this purpose wasn’t really at the game’s heart. Just a few fixes and a primary sponsor to be acquired and with any luck the game will be up online in a month’s time! 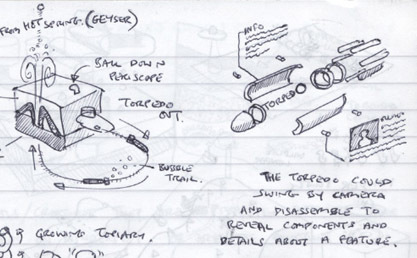 What do you get if you trap an armed submarine in solid ice? A geyser and some happy fish of course! Offset images create a really effective illusion of refraction. There’s only one orange fish in the lake but occasionally you’ll see two. 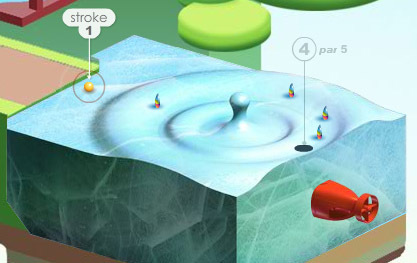 This lake offers probably the most unique of surfaces for a golf hole. Ever skimmed a stone at the seaside? Similar principle here. I’m ploughing methodically through a to-do list now. 21 items left. If only I could stop adding more items to that list! Next up, family wedding in Vegas! 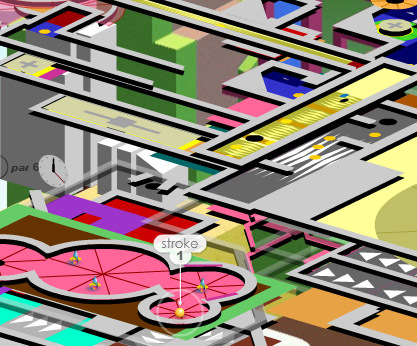 And then….. oh yeah, finishing an unfinishable project called Wonderputt. I’ve decided not to give ETAs anymore. They’re no better than dangling carrots. A shiny rocket ship to bookend the course and send our radioactive golf ball back into outer space where it came from. Play tester feedback lists are tall, but they’re mainly small fixes and every improvement makes a big difference. Come on people, criticism is your best colleague. Its a bitter relationship, but productive and invaluable bruising all the way. Don’t you just love that wooshing sound February makes as it wizzes by? And March… and… April is sounding rather wooshy too! Currently on commission work for an interactive art app of sorts, so Wonderputt is on hold for a short while. Industrial and city holes, all looking rather sparse at present so I’ll need to put in some windows etc on the tower block to make it feel more inhabitable. Air vents on the factory floors working well at pushing the ball around and up into the air. Hit quite a bomb shell a week or so back where I realised the game was far too big for most games portals and so had to knock 150 pixels off the width! Arghhhh!!! This took a solid two days alone to realign all the graphics and courses. I guess I’ve only myself to blame. All the sound and music is in now so it really is just a case of finishing visuals and tweaking to play test feedback. Dan is making great progress on sound and music. 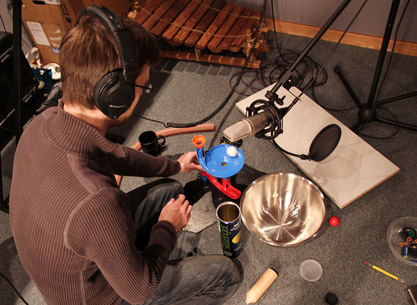 This photo is from a foley session for ball knocks, pops and rolls using wood, carpet, cardbox box and metal sheet. Schedule wrecked yet again, this time by flu, gah! 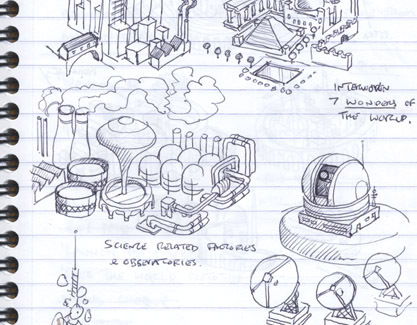 Here are some sketches of industrial infrastructure, man made wonders and scientific machinery. Not sure how much of this will make it into the game as things are getting rather cramped. 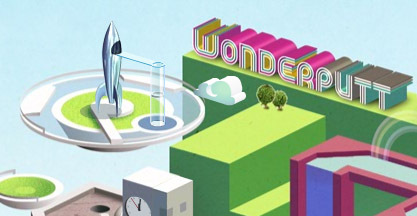 Back on Wonderputt after more unexpected contract work. Main bulk of the work is now the 18th hole, polishing, playtesting, optimising and improving the game as a whole. Further archaeological cross section reveals a pitted fossil of… well its supposed to be a dinosaur but this isn’t quite clear enough yet. Do I emphasis the pitted topographic plain, or the bones of the fossil? It seems I can’t do both. I expect this will go through some changes. 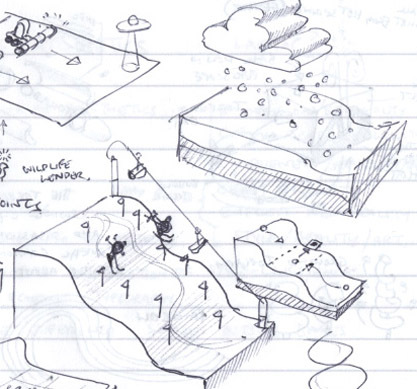 Holes 14 & 15 integrate a helix ramp, balloon ride and a mysterious stone circle. 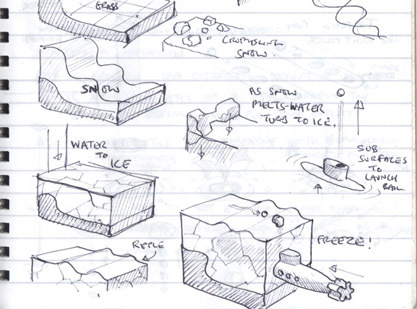 One thing that seems to have really expanded the schedule is the convoluted way of getting a course from layout to a three dimensional illustration. This has required the use of a mix of applications with each hole demanding a bespoke approach to getting the final result. Its all starting to pull together now which is really promising but as usual, polishing takes time. I’m also considering buying a new office chair as the padding on this one has pretty much disintegrated. Here’s a word from the three armed media man at Redtone Media with an update on the audio! Polished up cattle barns and circus tent. No cows were harmed in the making of this golf course. No this isn’t a rip off of a Mondrian. He never used the colour green for a start. 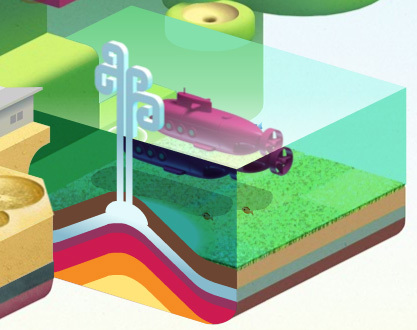 This is a peek under the bonnet of Wonderputt. 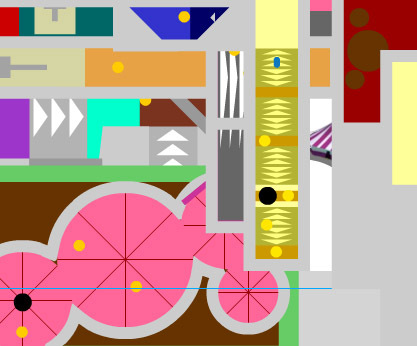 A screen grab of the layers in Flash that make up its 18 courses on 9 separate platform heights. This is what goes on in the background as the ball passes over various borders, ramps, lifts, collectable zones and holes. You can just make out the meteor craters in pink – bottom left. 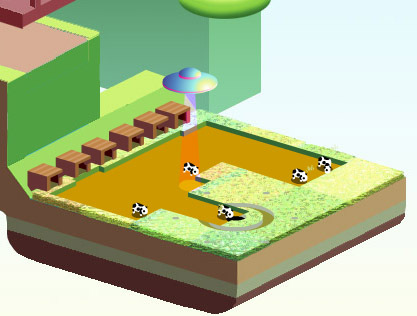 Publishing the game from Flash produces a skewed (isometric) duplicate set of these layers for the purposes of playtesting and screen grabbing the layout which is used to flesh out the overlayed illustrations. You see, its alllllllll about cheating. This looks like a nightmare to work with… and you would be right. It’s a complete nightmare and I’m still coming to terms with my delusions. This is how the exploding airfix torpedo is looking. Plastic and toylike. 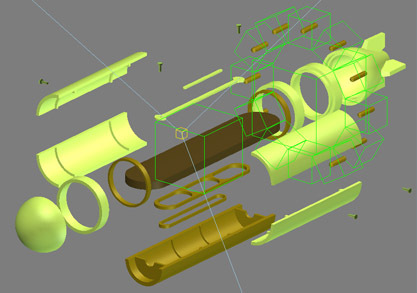 Quite a long winded process of rendering each component out seperately and reassembling it in Flash, then animating it to match the 3D movie guide exported from 3DSMax. Sounds are really going to put the icing on the cake for mechanisms like this. Again, way too much work in fancy transitions for such a brief moment’s putting. But hopefully watching will be half of the insentive to play through all the courses. 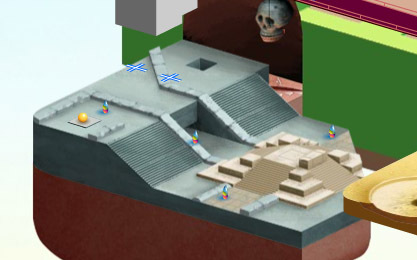 The Aztec hole is starting to taking shape now, with lifts and moving platforms. Shame its all over so quick really, might have been nice to have set up the whole game like this to reuse functionality more than once. Back on track now to get this finished for February. Trying to get some reuse out of some of the themes to increase the total number of holes. Naturally 18 will be ideal but its going to be a case of reuse more than entirely unique themes for each hole which takes TIME! Dan at Redtone Media is making a start on sound effects. 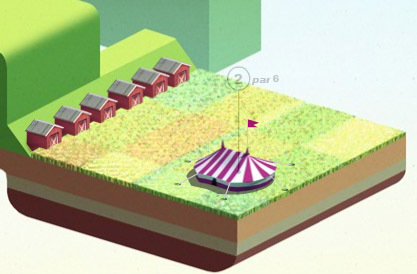 It looks like its going to need a lot to compliment the various themes but I think this will really enhance the visuals and experience of each hole. Current thinking is to maintain a nice balance between scientific and fun, ideally retaining the charm and nostalgia of old science books and tv docs without going too whimsical. Progress has to be put on hold for six or so weeks during contract work. Launch date ETA February 2011. 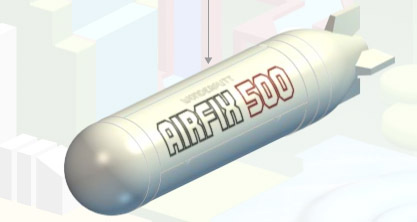 This shows the torpedo model in 3DStudio Max. Hopefully this diagramatic explosion will transition smoothly in Flash from static components. That’s the efficiency with an isometric view, so long as elements don’t need to rotate. The torpedo will fire from the submarine trapped in the ice. 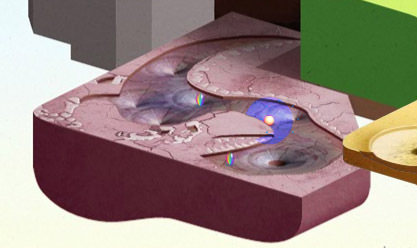 After the exploded diagram hole, the torpedo will continue on a collision course with the earth crust to cause the erruption of a hot spring. 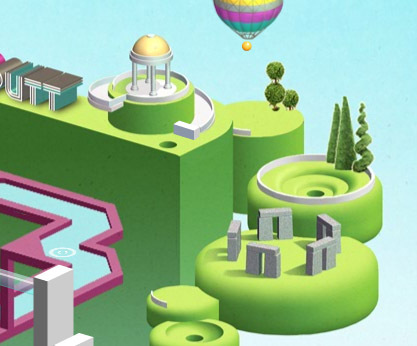 I just had to get something escheresque into the game so the waterfall illusion seemed the most suited for crazy golf. 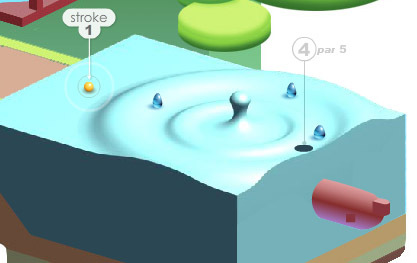 Here is the Ice ripple hole in more detail. Looking a little too marble like at present. The submarines tail needs to create some local ice cracks to help fuse them together. I’m considering sitting a bemused squid on top of the frozen droplet. Collectables keep changing. Hole 4 the snow melts and turns to ice freezing mid ripple and capturing a submarine for a particularly tricky putting hole. Ok so I’m beginning to realise how much work there is left to do and a November release is looking more ambitious as the days roll closer to contract work in London. I’ve underestimated how tricky balancing aesthetics with level design is without compromising gameplay too much. This has proved a very time consuming task. I’ve run into a problem with a topery maze that refuses to offer consistancy in play, so I’m considering scrapping it. Damn it! Hole 3 ski slope with working ski lift track. Any of this making sense yet? 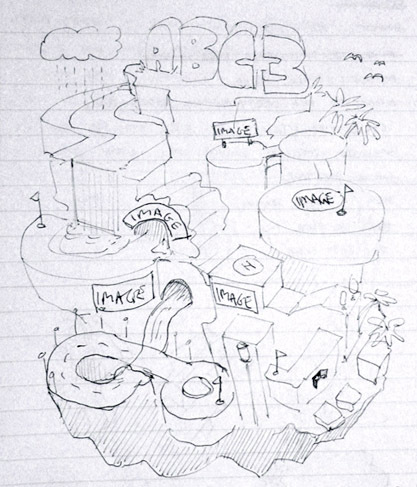 Here are some sketches of the snow cloud transition into a ski slope. e-newsletter, now with GDRP goodness! Damp Gnat is BAFTA Breakthrough Brit 2014 Reece Millidge's games, interactive arts & animation studio in Brighton UK. Our current focus is on developing entertaining games for browser and mobile with a strong emphasis on narrative and design to tickle the brain and challenge expectations.